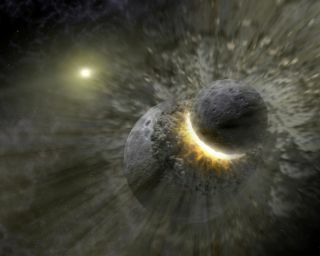 Earth's moon was born from a violent collision between the early Earth and a Mars-size object that scientists call Theia. New research suggests that the lunar rock debris from that crash mixed in with Earth's rocks. Previous research suggested that about 100 million years after the solar system formed 4.6 billion years ago, the newborn Earth was hit by a Mars-size rock named Theia, named after the mother of the moon in Greek myth. Debris from the collision later coalesced into the moon. Now scientists find evidence that the rocks that went on to become Earth and the moon were thoroughly mixed together before they separated. This suggests that "the collision that formed the moon was a high-energy impact," said study lead author Edward Young, a cosmochemist and geochemist at the University of California, Los Angeles. The researchers analyzed seven moon rock samples collected during the Apollo 12, 15 and 17 lunar missions. They also examined one lunar meteorite — a rock that a cosmic impact knocked off the moon, which later crashed on Earth. Previous research from another group in Germany found subtle differences in oxygen isotope ratios between Earth and the moon, differing by about 12 parts per million when it came to oxygen-17. This prior work suggested that less mixing occurred between Earth and the moon than now proposed. This piece of the moon collected by astronauts on the Apollo 17 lunar landing mission shows a sample of lunar highland rock as viewed in cross-polarized transmitted light. Young and his colleagues said their analysis was more precise than previous studies because they were able to identify and overcome potentially major causes of error, such as contamination by water. "It should be remembered that the new level of precision that we are working with is challenging, and so it is not surprising that there will be some disagreement in the beginning," Young said. Isotope geochemist Andreas Pack at the University of Göttingen in Germany, whose group previously found oxygen-isotope ratio differences between Earth and the moon, said this new research presents "high-quality data along with a sound explanation for the surprising similarity of Earth and the moon. There is nothing for me to criticize." These findings suggest that the newborn Earth and Theia contained substantial amounts of water bearing oxygen-17, the researchers said. This water may have come in the form of ice- or water-laden minerals, they added. In the future, "we will be measuring many more lunar samples to get a feel for what sort of variability there might be from terrain to terrain on the moon," Young said. "For example, we see evidence for oxygen isotope differences between basalts on the moon and the highlands of the moon. These differences mimic similar variability seen here on Earth." The scientists detailed their findings in the Jan. 29 issue of the journal Science. Follow Charles Q. Choi on Twitter @cqchoi. Follow us @Spacedotcom, Facebook and Google+. Originally posted at Space.com.